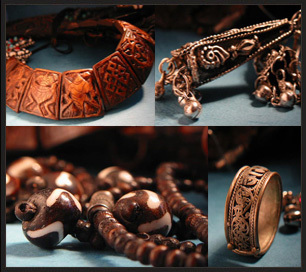 Our Tibetan Handmade Bracelets Tibetan Silver Bracelets were handmade in Tibet & Nepal. Currently we have 4 sections of this category, Tibetan Turquoise & Coral Bracelets, Tibetan Stirling Silver Bracelet, Tibetan Yakbone & Nickle Silver Bracelet, Men's Bracelets. 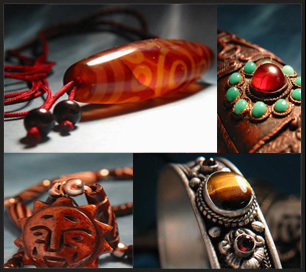 On this page you will find our charming ethnic handmade tibetan bracelet we hand picked in Tibet & Nepal especially for you.. All our tibetan bracelet are hand picked and inspected strictly before shipping, which promise you 100% quality and satisfaction! Many Tibetan Bracelets are handmade from 925 stirling silver, of which some engraved with dedicated buddhist symbols like the om mantra bracelets, the 8 sacred buddhist symbols bracelets, some engraved with powerful animals like dragon. We selected the fine tibetan stirling silver bracelets in Tibetan, Nepal and India for our customers worldwide. A Tibetan Malas bracelets, namely the buddhism beads is a string of prayer beads, comparable to a rosary, used when reciting mantras or counting prayer. Tibetan Malas are usually made with 108, 27, 21 or 19 beads. They are used to count prayers or mantras. Buddhists use counters to keep track of how many times around a mala they have counted. Malas made of wood are the most common, but some of our most popular are made of turquoise, copper, lotus seed and yakbone bone. Check out our handmade turquoise malas, handmade copper malas, handmade lotus seed malas and handmade yakbone malas. Labels: tibetan bracelet, tibetan bracelets, tibet bracelet, tibetan prayer bracelet, tibetan silver bracelet, tibet bracelets, tibetan silver bracelets, tibetan bead bracelet, sterling silver bracelet, buddhist bracelet, mala bracelet, mala bracelet, om mani padme hum bracelet, buddist bracelet, mantra bracelet, sanskrit bracelet, malas bracelet, turquoise bracelet, handmade turquoise bracelets, coral bracelets, mila amber bracelets, tibetan amber bracelets.